Despite his recent UFC 133 loss against Rashad Evans, Tito Ortiz still earns a spot in Fighting Insider's list of MMA's best fighters. 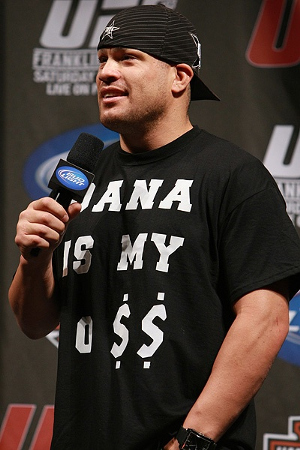 Born as Jacob Christopher Ortiz on January 23, 1975, Tito Ortiz is one of UFC’s early stars, CEO of Punishment Athletics MMA equipment and clothing line, and the owner of Punishment Training Center in Huntington Beach, California. During his sophomore years, he started wrestling at Huntington Beach High School under coach Paul Herrera. As a senior, he finished fourth in the state high school championship. He continued his wrestling career at the Golden West College, where he won the California State junior college title. After that, Tito Ortiz also wrestled for Cal State Bakersfield. Tito Ortiz’s MMA debut was in 1997, where he defeated Wes Albritton at UFC 13. His nickname “Tito” – which means “tyrant” – was given by his Mexican father.